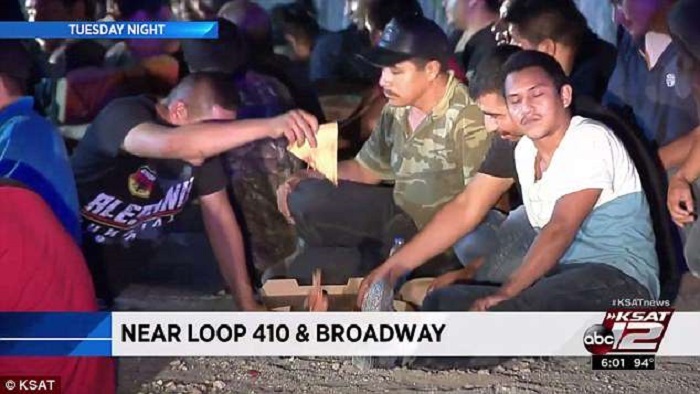 Armando Colunga of San Antonio was watching the news on Tuesday night when he saw a report about officials discovering 54 undocumented immigrants in the back of a semi-truck. The undocumented immigrants were sitting in a group on the ground, detained by authorities as they waited to be questioned and transported. Colunga says that he wondered how long they were in the truck and was motivated to help. He heard that they had only been provided with water, and so the tow truck driver drove across town. He said that he figured they must not have eaten in some time and were probably hungry. He stopped at a Little Caesars near the scene and purchased seven pizzas with his own money in order to feed the detained individuals. The 54 undocumented immigrants represented a number of countries, including Guatemala, Mexico, Brazil, and El Salvador. The youngest in the tractor trailer is reported to be a 16-year-old. Colunga, who has Mexican heritage, notes that his good deed was a matter of humanity rather than race. "It wasn't for the attention . . . Like I said, I felt it was something I had to do. They're all humans." Colunga was initially worried that authorities at the scene would not allow him to give pizza to the immigrants, but he was pleasantly surprised when they permitted the pizza to be distributed to the group. Colunga said that he didn't get the names of the three detectives who helped him across the crime scene tape to hand out pizza, but that, "I just want to thank them." San Antonio Fire Department chief Charles Hood notes that thankfully the truck was air-conditioned and had water, and everyone appeared in good health. Five people were transported to the hospital for minor injuries sustained while exiting the truck. The driver of the semi-truck was identified as 36-year-old Gerardo Carrero of Laredo. He was arrested and will face federal human smuggling charges.